Is safety a concern for you? Will children be around often to play and watch the game? Traditional solid rods go through the sidewalls. They can poke the rival player’s stomach, children’s faces If they are around and looking on. This is a seriously under-reported injury and should make parents or child-care givers very concerned. Telescopic rods are definitely a better choice for safety reasons in addition to the excellent maneuverability. The gap between the tip of the foot and the playing field, often too wide on many tables that the ball cannot be reached in many dead spots. A good foot shape with a large surface at front and back as well as on both sides to pin down or stop the ball from getting to rival’s zone of control and pass laterally to the men on the same rod. Without such design, the ball can easily slip away to the rival’s territory — very frustrating. Good ball control is half of the game won. Light rods, grippy handles, and lubrication. Less inertia to overcome and no slipping ensure fast response and good ball control with less strain on muscle or wrist injury. Telescopic rods or hollow rods are definitely better. Playing figure coverage overlap. Certain overlap is desired so that each man can cover a wider area crossing over the coverage zone of next man on the same rod. A 1.5″ overlap is the least required on the 3-man offense rod and 2-man defense rod. A 1″ overlap is a plus on the 5-man rod. This allows more flexibility in the use of men for any ball position and increases the angle of offense and defense. No overlap or even falling short of covering the whole line is bad, creating spots no man on that rod can reach. There are indeed tables like that. Field surface and ball surface. These surfaces, if too smooth or slippery, contribute to difficulties of ball control. Soccer look-like balls do not help. Ball material is the most important factor. Do the men wiggle on the rod? If they do, expect them to wiggle even more and more over time since the gaps expand on frequent impact from kicking the ball. It feels like playing soccer wearing an over-sized shoe. This tends to happen to low-end tables with frequent men replacements. Side slopes on both sides of the playing field to make the ball roll off and towards the centre, so the ball does not get stuck on the side. Most foosball tables use plastic add-ons. On Rock-it, this side slope (1″ in width) is built in as a part of the playing field. Machine-ground balls to achieve a rough surface on balls of slightly elastic material, for good ball control. Relatively flat playing field board supported underneath by strong supports. Pre-assembled table structure or pre-installed men on rods to reduce installation time. How are the playing rods constructed? Playing rods and how easily they can be handled during fast-paced playing are the single most important factor determining whether or how much fun a foosball table can offer the end user. This is mostly decided at the drawing board. Good playing rods should be mobilized easily by the player and should closely follow hand motion to pass the ball and make or block shots. If the rods cannot be moved fast enough to catch the ball or to make a planned shot, it is the most frustrating thing in the world. In such situations, no intended shots can be executed; the sense of satisfaction and fairness is lost; the arm gets tired quickly or even injured. Some people resort to spinning the rods to strike the ball at random. There is no fun playing this way. One could find such tables everywhere. Yes, frequent lubrication of the rods can help. Some lubricants can even become very sticky after a while to make rod handling even harder. The problem just doesn’t go away. Since rough rod-handling is caused by too much friction inside the rod bushing/bearing, and friction is a function of weight on the contact surface, reducing rod weight and thus the contact surface friction is the only viable long-term solution to the problem. Imagine holding a 7-pound rod (traditional solid rods) and trying to overcome weight and friction. How can the player catch the ball or make pre-emptive shots when the hand and wrist are so much burdened? The foosball industry has recognized the need to reduce rod weight for easy handling. Some manufacturers use hollow rods with a small hollow hole going through the center of the rods. These hollow rods are still very heavy. They also extend outside the side walls, which can be a safety hazard. Then telescopic rod structure came with the inside rod mounted to one side wall without going through it and the outside rod being the only moving part. The outside rod is weighed a small portion of the solid rod of the same diameter beside shortened length. There is much less inertia to overcome while handling the rods, and they react quickly and easily to players’ hand operation. However, telescopic rods must be constructed with particular material and dimensions to best balance strength, weight, and space for the inner rod. Recently, nylon ball bearings have been seen to replace rod bushings to facilitate rod handling by reducing friction against solid rod movement. These bearings work well to a certain extent, especially in facilitating spinning. However, a simple try-out will show that the weight of the solid rods can still greatly reduce the speed at which rods are moved laterally. The inertia of the 7-lb. rods just feels too heavy to pull or push fast enough to keep up with the pace of the game. Many skill shots rely heavily on rod speed to pass around the blocking men to score. Heavy inertia just slows down rod speed and compromises skill execution even with no friction. Furthermore, some customers report that the small nylon balls in the bearings can easily dislocate and fall out, especially after playing wears the balls into smaller and skewed shapes, leaving a layer of nylon residue on the rods which may also obstruct rod handling. Sometimes the rods may even seize as tiny plastic balls get stuck in the bearing. On the other hand, with light telescopic rods, friction is much smaller in all contact areas. Ball bearings are not needed. In fact, some industry insiders admit that ball bearings are more a marketing gimmick than a real treat. 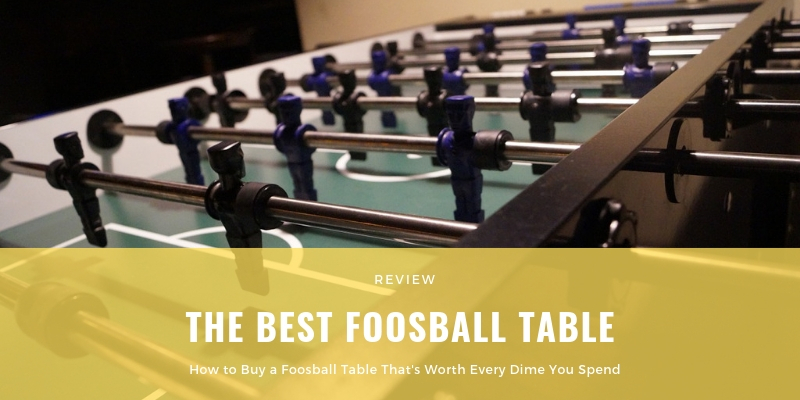 So when you see a foosball table with ball bearings, do not just try the rod spinning ( it spins great, for some time), try to move the rods fast laterally too, to catch a flying ball and do some ball passes. A simple survey of some foosball tables around you could indicate the following: when solid rods are pushed or pulled forcefully in intense play to cause the rubber bumpers to hit the side walls hard, these side walls may bend a bit and yield to such impact and shake the game structure built mostly of wood or plywood. Over time, this repeated impact can easily break the rod bushings or strike them loose and make the whole game table shaky. Even worse, playing men can become loose. Parts replacements are inevitable. Wrist injury from rigid shock impact and arm fatigue from laboring the heavy solid rods are also prevalent. Again, all these problems can be attributable to the heavy solid rods, the great inertia and the rigid impact on the side walls. Furthermore, no matter how well designed the rubber block bumpers can be, the range of elasticity is very limited. The rubber block can also be easily damaged through use, simply due to the easy wear and tear of the material..